When Joplin’s finest hotel and one of her great architectural gems vanished from the cityscape in 1978, it did not mean the complete disappearance of all traces of the fabled institution. For those wishing to find glimpses into the Connor’s architectural past, there are at least three pieces of the Connor spread across two locations in Joplin today. 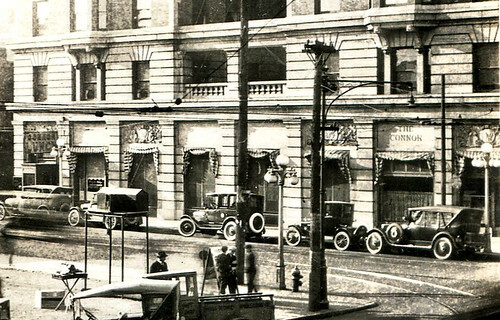 They are decorative pieces of the exterior of the Connor, which like the interior, were stripped from the hotel prior to her expected demolition. The first two pieces can be found in the same location that they arrived at around 1907, when delivered to the Connor to be placed upon her exterior. They are at the Joplin Public Library at 3rd and Main. The Connor property was purchased by the city in the 1970’s with the express intent of demolishing the hotel to build a new library on the spot. It’s regrettable that the Connor could not have been renovated for the same task. 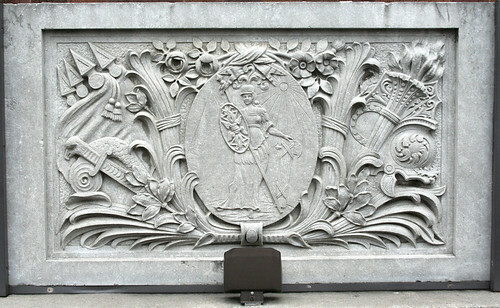 As a tribute to the marvelous building that the library replaced, two friezes from the exterior of the Connor were set on the west facing wall of the library on the parking lot (Inside, the library devotes a glass cabinet to the history of the Connor). 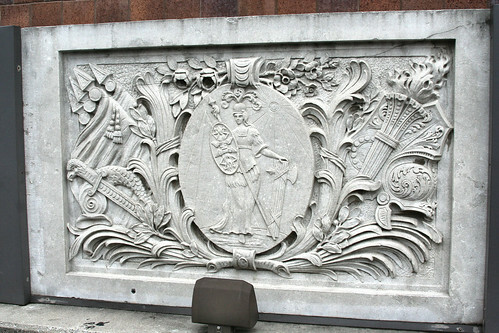 The frieze is joined by another, which at first glance appears identical. However, closer scrutiny will show slight differences between the two pieces of artwork. Below is a close up of the Connor prior to the addition of its annex. Note the friezes above the windows. Close up of the Connor Hotel with friezes over the window. 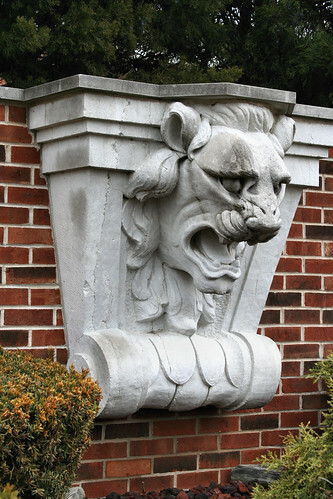 The third subject of this post is a lion’s head located across town from the Connor’s location and can be found on the campus of Missouri Southern State University. 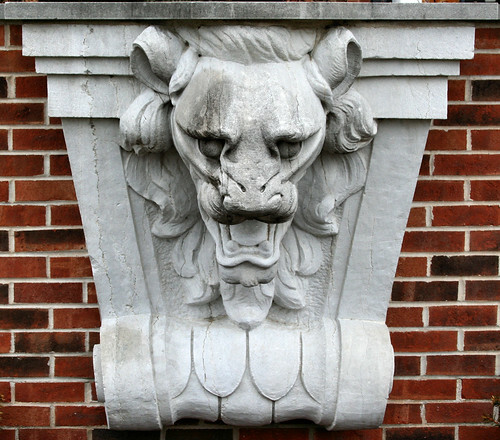 Specifically, the lion’s head, which snarled above the main entrance of the Connor, is placed on a short brick wall in front of the Spiva Art Gallery. And now a full frontal view of the lion, which would have been seen by the men who affixed it to the exterior of the Connor, as well as those who took it down. Know of any other remnants of the Connor? Please feel free to comment or write us to let us know! Thanks for the tip! We’ll definitely have to check out One Way Design to see the bar. My dad owns a pedestal sink a door knob and a mail chute from the connor hotel. The sink has a special knob for ice water their in great condition. except for the mail chute. it has a small crack. I also know of the wearabouts of i think two windows used in neosho. Thank you for letting us know that more remnants of the Connor survive! We would love any photographs you or your dad might be willing to share! The house on 2020 Jackson has a 6′ clawfoot bath tub from the Connor I’m wanting to buy the house mostly for that reason. That sounds like a perfectly good reason to buy a house!